Newly clean and sober with few prospects for a job or housing, Stephen joined the Army and was in active combat in Vietnam. While serving, Stephen relapsed and began drinking and using drugs again. Stephen left the Army after seven years of service and lived in Washington, DC, working as a chaplain with Mitch Snyder, a prominent activist and advocate for the homeless. After a few years he moved to Santa Cruz, California, where he started volunteering at the Homeless Services Center. He worked countless volunteer hours at the center and eventually he became part of the staff. He then worked his way up to becoming the Community Service Coordinator for the shelter, earning many awards and accolades along the way. In 2013 he was awarded the University of California Santa Cruz Tony Hill Award, which recognizes local Santa Cruz residents for their work in the community. The award also recognized the more than 20,000 service hours that Stephen and his team of homeless volunteers logged around Santa Cruz. A few years after winning the award, Stephen retired from the shelter and moved back to Washington, DC. He had enjoyed living in California, but wanted to be back in the city where he had started his work so many years ago with Mitch Snyder. Unfortunately, despite his many years at the shelter and his earlier work for other nonprofits, Stephen didn’t have any retirement savings and soon found himself homeless. He was living in a park in Northeast Washington, DC, and one day passed by a partially constructed building. After many years of working to help others, Stephen now has a comfortable, safe and affordable place to call his own. 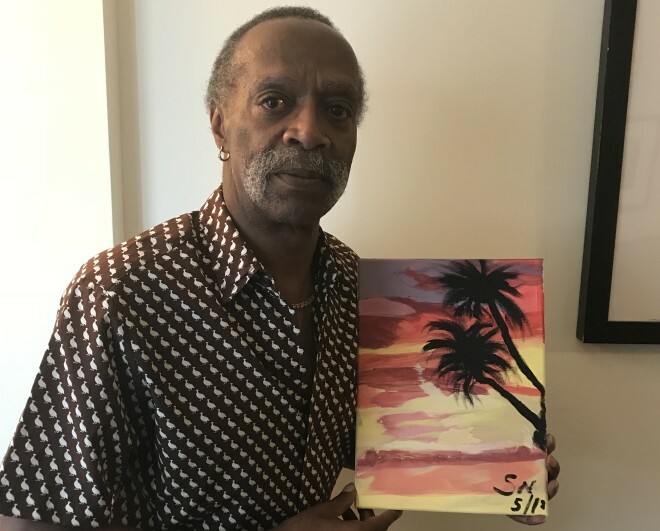 “I’ve always known how to take care of others by working at and running a shelter, but I never knew how to take care of me.” Visionary Square has provided Stephen with the stability and independence to do just that.